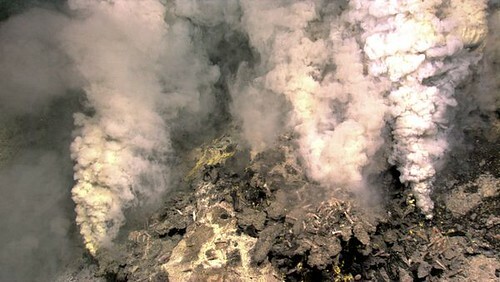 Captured by high-resolution cameras aboard a robotic submersible, mineral-rich water spews from hydrothermal vents in this June 30 picture of Kawio Barat, a massive undersea volcano off Indonesia. During the past few weeks, the submerged volcano– one of the world’s largest– was mapped and explored in detail for the first time by a joint Indonesian-U.S. expedition north of the island of Sulawesi (map). Read the whole story, and see fascinating video, at National Geographic. As we batten down the hatches, we might recall that it was on this date in 64 CE that the Great Fire of Rome began, ultimately destroying much of the Imperial City. The fire began in the slums of a district south of the Palatine Hill. The area’s homes burned very quickly and the fire spread north, fueled by high winds; it raged out of control for three days. 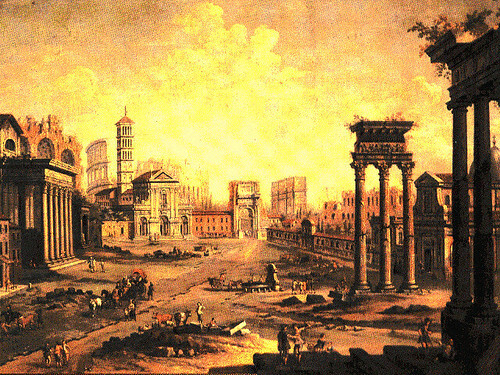 Three of Rome’s 14 districts were completely razed; only four were untouched by the conflagration. Hundreds of people died in the fire and many thousands were left homeless. Legend has it that the Emperor Nero fiddled while the city burned. Aside from the facts that the fiddle did not even exist at the time (Nero was an adept of the lyre) and that he was actually 35 miles away in Antium when the fire broke out, there could be something to it. « Greetings from the Snapping Turtle State!